For Felix's TV filmography, see Felix the Cat (TV series) § Episodes, The Twisted Tales of Felix the Cat § List of episodes, and Baby Felix § Episodes. 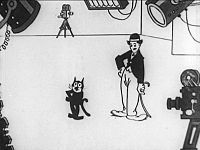 This is a complete list of animated films released theatrically starring Felix the Cat (169 silent cartoons and 15 sound cartoons, for a total of 184 cartoons). "View" links are linked to a public domain file of the cartoon at archive.org or the official British Pathé archives at britishpathe.com. The first 25 Felix cartoons were distributed to theaters by Paramount Pictures. The character was named "Master Tom" until The Adventures of Felix. From The Non-Stop Fright (1927). It is unknown if new Felix cartoons were produced during this period or if First National (sister company Warner Bros.) only redistributed earlier Felix cartoons. 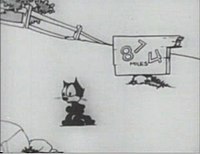 Copley Pictures was the first distributor to issue Felix cartoons with sound. There were 12 originally with sound, and 15 reissues, for a total of 27 cartoons. A number of silent Felix cartoons were also re-issued by Copley at this time, with their intertitles removed and sound added. Newer simple titles were also inserted in most reissues, which removed signs of Educational Pictures copyrights. However, in some cases, original titles and intertitles were retained. Jacques Kopfstein was hired by Pat Sullivan to add sound to the film. This was done via the "goat gland" system of adding sound. All Felix shorts that were re-issued in sound have Post-synchronized soundtracks. (The soundtrack was made to match the already-existing film.) As a result, the synchronization is not perfect, and there is occasionally an audible delay between the action and the sound effect. Copley also distributed 12 cartoons originally with sound. This short revival of Felix (as a more gentrified character) was produced by Van Beuren Studios and distributed to theaters by RKO Radio Pictures. All of these cartoons were from the Rainbow Parade series and produced in three-strip Technicolor. More than five decades following the last theatrical shorts, a Felix feature film was produced. Though intended to be released theatrically, however it didn't happen and was released as a direct-to-video feature instead. ^ a b c d e British Pathé. "Felix The Cat". ^ a b David Gerstein (October 8, 2011). 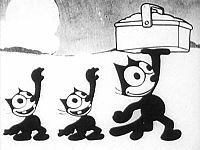 "Felix the Cat Filmography 1919-1930?". GAC Forums Archives. Golden Age Cartoons. Archived from the original on May 14, 2012. Gerstein, David A. (2007). "The Classic Felix Filmography". The Classic Felix the Cat Page. Retrieved 2009-04-10. Canemaker, John (1996). Felix: The Twisted Tale of the World's Most Famous Cat. Da Capo Press. ISBN 0-306-80731-9. This page is based on the Wikipedia article Felix the Cat filmography; it is used under the Creative Commons Attribution-ShareAlike 3.0 Unported License (CC-BY-SA). You may redistribute it, verbatim or modified, providing that you comply with the terms of the CC-BY-SA.